Rahul Dravid: Indian Batsman & A True Cricketer. Imagine a match going on between India and say Pakistan.Indians are chasing a target around 270-280 and struggling at 60 for 4 in 13.0 overs. (Dravid still at crease). What an average Indian supporter will do? 3.Try to forget everything about the match. What will I do? I will stick myself in the sofa and watch Dravid's batting till the end. 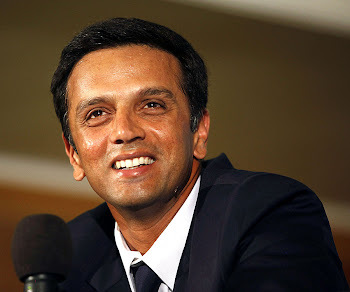 (The End is generally sweet).Rahul Dravid's greatness is that he is capable of staying at the crease irrespective of the behaviour of pitch,the kind of bowling and the pressure on the team. What is perfect technique in batting? You will get the answer when you will watch Dravid's batting.He plays fluent cricket.Keeps the scoreboard moving without making the situation chaotic.I'm fan of TEST CRICKET.So I enjoy to watch a batsman taking easy singles,twos.Rahul Dravid is master in Test matches.He has the stamina to stay at the pitch for a full day. He will never play just for money.He will not go on making advertisements just for money. He has not played for Man Of The Match award (he has received just 23 such awards),but still he is known to be one of the best cricketers.Why? The answer is easy--he wins the matches for India. This great quality has helped him to win the hearts of cricket fans.He will continue to be the best and consistant cricketer in the world. Absolutely this article is true. watching the full innings of rahul whether he scores or not,will help the budding cricketers to learn more.